Paul Cook hailed the ‘proven’ quality of Joe Garner after the much-travelled striker got Wigan Athletic out of jail against rock-bottom Ipswich Town. 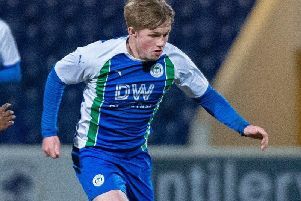 Latics had a numerical advantage for 65 minutes at the DW on Saturday after Jonas Knudsen was shown a straight red card for hauling back Leon Clarke in full flow. But Town - who have been cast adrift at the foot of the Championship - incredibly took the lead seven minutes later, through Will Keane’s penalty. And the 90 minutes were up when Garner, on as an 81st-minute substitute, turned in Reece James’ inch-perfect cross, to deny the club he left for Wigan last summer. “We knew the best way of scoring was to get round them and on the end of crosses into the box,” acknowledged Cook. “Joe’s a proven target man, a proven goalscorer, and you know when the ball goes in the box he’ll be there at the far post. The point extends Wigan’s unbeaten run to four matches - the longest of the season to date. But the booing that greeted the half-time whistle, and was also evident during the second period, showed a section of the fanbase were less than impressed with what they saw. Cook, though, remains steadfastly focused on the bigger picture - Championship survival. “Football’s such an unforgiving game these days - for players, managers, everyone,” he recognised. “There’s so much criticism levelled at people so quickly at the moment. “Sometimes you just don’t understand it, but that’s the game we’re involved in. “The target at the start of the year was to try our best to stay in this league.